Chandrabose is a name that instantly connects to youthful and funny Telugu film lyrics. 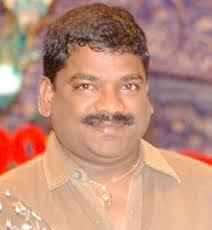 He is from Challagariga of Warangal district, which was where he completed the high school education. He completed his diploma in Electrical & Electronics Engineering in Hyderabad and continued to do my B.E. in the same discipline from JNTU-Hyderabad. He wrote for 520 movies till date, accounting to over 1500 songs. There's an adage that says "old times are better than the times to come" ("gata kaalamu mElu vacchu kaalamu kanTen"). Just a little wordplay here - jumble the terms, and it also reads "Better times come than the old times" ("mElu kaalamu vacchu gata kaalamu kanTen")! This summarizes what he feel about the changing times in general, and in this context too. Not every old song or song from the past is a gem, and not every new song is trash. There are all kinds of songs always, and he firmly believe that times change for overall good. There's nothing to feel bad about such transitions that Time brings. Chandrabose: People should realize that a family is an extension of an individual, and the society is an extension of the concept of family, and the world itself is simply a big society... the roots of which lie at the individual-level. Therefore, I'd insist that change should start at home, definitely! My son goes to Jubilee Hills Public School, but I made a point to teach him to address me as "naanna gaaru". ...An addressing doesn't seem to matter, but that's only a starting point, I'd say. Both my son and my daughter are good at Telugu, and I encourage them to read a lot about the language and grammar and several Telugu books within their reach. I try to set an example to them saying that I read a lot even to this day how much ever busy I am with my schedules, and emphasizing how important it is to read and enhance one's knowledge. There's a Lord Siva temple in his neighborhood and he grew up with all the devotional songs that were played in the temple every morning... Sree M.S. Ramarao's sundarakaanDa, Sree S.P.B's lingaashTakam and other Siva stOtraalu, Smt. Sobharaju's annamayya keertanalu, Sree Balamuralikrishna's gaNapati praarthana and tattwaalu, Sree Ghantasala's devotional songs, etc. He got up every morning with all the enchanting songs and it was growing up with music. He used to participate in bhajan-s and he developed a penchant in singing too. He developed a habit of writing his own lyrics and singing them to his own tune, rather naturally. His engineering degree was a part-time course and his classes were in the evening. He always tried to grab every opportunity to sing and he received applause from his little groups of audiences around his room in Kukatpally. ...In fact, his priority was more towards being a singer than a lyricist. He tried his luck to get a break in AIR and Doordarshan as a singer but he always returned dejected and disqualified. It was then that one of his friends, Srinath by name, suggested to me to have a better spark in me as a lyricist than as a singer. With renewed interest in penning lyrics, created a "lyric bank" for myself with songs of various genres - youthful songs, love songs, duets, teasing songs, etc. Srinath formed a rapport with Muppalaneni Siva gaaru through his relatives who knew the director, and Srinath introduced him to Siva gaaru eventually. By then, Siva gaaru already directed Gharana Alludu (Krishna-starrer) and was readying the subject to make Taj Mahal. Srikanth was impressed eventually introduced him to Ramanaidu gaaru. Eventually, music director M.M. Sreelekha gave him a tune when music sittings happened. The song manchu konDallOni chandramaa!... thus marked his debut in 1995. Most of the K. Raghavendra Rao-M.M. Keeravani movies, he wrote lyrics first. More examples are elaa elaa elaa elaa telupanu... (Nuvvu Leka Nenu Lenu), telugu bhaasha teeyadanam... (Neeku Nuvvu Naaku Nenu), cheeralOni goppatanam.